As part of my 25-country travel goal, I decided to do a destination round-up every week of the countries I’ve travelled to leading to this goal. I’ve been to 21 countries so far, and with little than a year left – I’m anxious to finish my travel goal really soon! First on the list, the Philippines-my country, my home! Now you ask, why am including the Philippines on the list even though this is my home country? For the simple reason really that THERE’S SO MANY PLACES TRAVELLING TO! We have a saying here in Filipino – “Ang di marunong tumingin sa pinanggalingan ay di makakarating sa paroroonan” (One who doesn’t look back to their roots would not be able to get to his destination). Knowing your roots and seeing your own country is as important as seeing the world. Your home country is a big part of your identity, you may like it or hate it, but in the end this will and always be your home. In the crazy world of travel, you’ll get asked (very) often, where you’re from and many conversations start from there. Your country is your own backyard. And with a backyard looking like this, I’d be crazy if I don’t visit them! I would be a hypocrite if I share to everyone that I’ve been to 20+ countries and failed to discover my own. And with the different provinces & cities being as diverse as the 7107 islands the country has, exploring it is an adventure that can equal the likes of backpacking around Europe or South America. Even worth doing a Philippines-only version of 25 Travels. I haven’t around the Philippines perhaps as much as I wanted to though I’ve had my fair share of travel. I’m happy I grew up in a family that values travel. For one, my dad and my mom’s families come from the opposite ends of Luzon – which meant road trips during summer and Christmas holidays. Plus, there were lots of city and road trips I’ve been in the past usually with friends. It’s paradise – hands down. And I think I’ve professed my love for this town too much. Friendly people, good food, great scenery -perfect! I know where I’m going to retire. I’ve only been here for a couple of days but my short stay gave me enough reasons to come back. 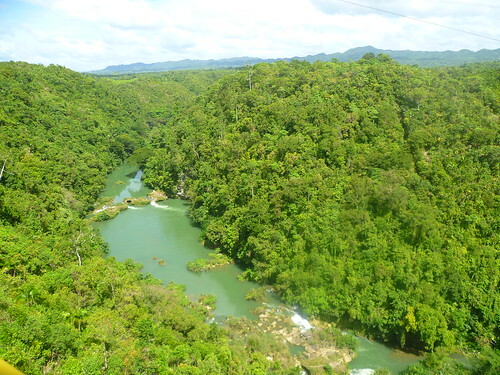 It’s it’s the place where I can be my own Indiana Jones – filled with chocolate hills, evergreen rivers, excellent diving spots and one of the smallest monkeys in the world. 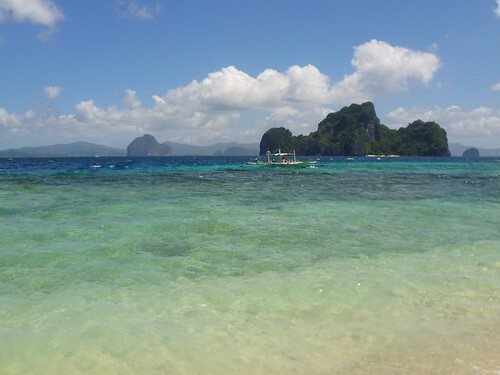 My trip to Donsol & Caramoan back in 2008 was my introduction to backpacking. I went with my aunt and her friend on a crazy whirlwind trip to Bicol region. We got to see the whale sharks in Donsol and lazy up on the beaches of Caramoa. It was my first true backpacking experience. We didn’t arrange anything and just went with the flow. I got to ride atop a bus over a cliff, slept next to chickens, and spent a day on island just by ourselves. Amazing! Of course, there is Metro Manila, my home region. I have love-hate relationship with this area, but to be honest as much as certain things bug me about Manila (traffic, cleanliness, the MRT on rush hours), I think this city has shaped who am I now – and I appreciate that a lot. 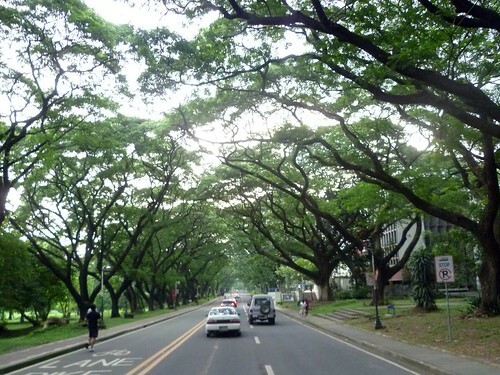 I particularly like the area of UP (University of the Philippines-Diliman), which aside from being my alma mater – it’s home to excellent & cheap food, street art and culture. This is a toss-up really, but I like the fact that Tagaytay and the view of Taal Lake is only 2 hours away from Metro Manila. It’s an easy weekend break which is great for relaxing if you decide you can’t take the city life anymore. 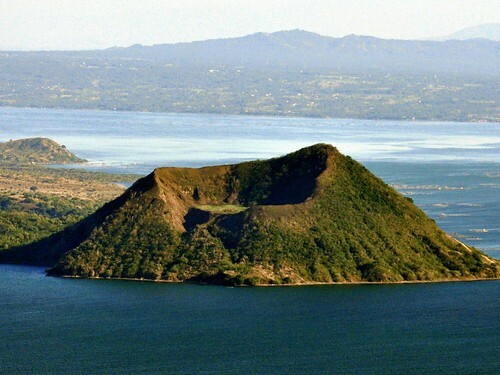 Plus, that view of Taal Volcano never fails to amaze me. The number one tourist spot in the country. It prides itself with stunning white sand beaches, palm trees and active nightlife. Now, I’ve only heard of Siquijor from a backpacker friend who went here for a few days. 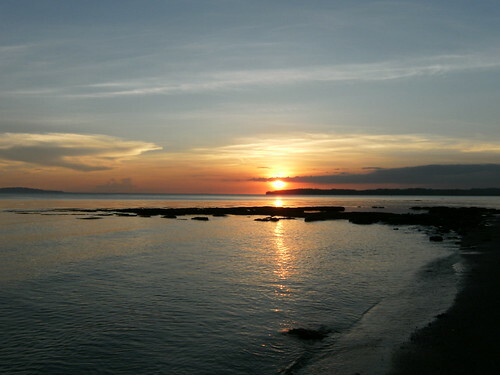 Siquijor is the province of witchcraft and folklore. It has great nature offering too of beaches, waterfalls and jungles. 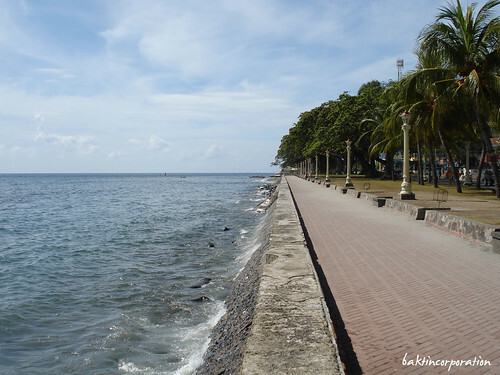 Very close to Siquijor actually is the town of Dumaguete – it’s the ancestral town of my paternal grandmother – and growing up I’ve heard lots of good things about this city. There’s good food (barbequed chicken) and a good balance of urban & rural lifestyle. 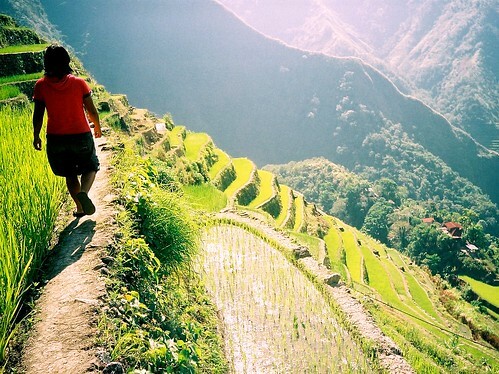 Lonely Planet just listed the rice terraces as one of the most endagendered sights in the world. This UNESCO world heritage site was built by the Ifugaos 2000 years ago. 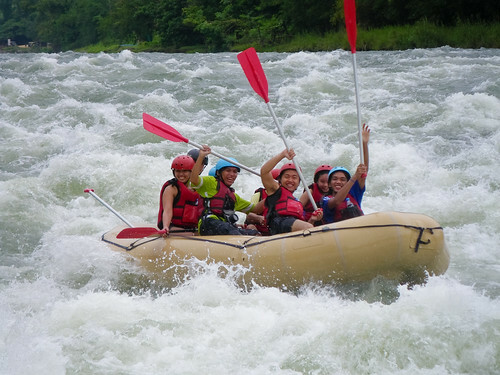 I haven’t been to the southern island of Mindanao I don’t know much about Mindanao to be honest – so for now, it’s a toss-up between Cagayan De Oro for white water rafting, and Davao for its beaches. *Flickr photos from: roxj, eesti, storm-crypt, B. Mercado, therealbrute, and A. Nelson. Under CC. Thanks! 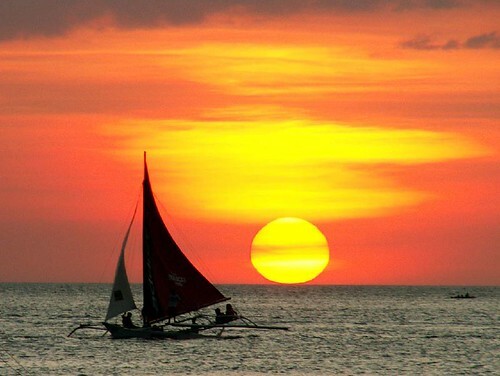 Have you been to the Philippines? What are your favourite place? Also, what are the things you are proud of about your home country? Wow, looks beautiful. I’ve only been to Manila & Tagaytay and loved them both, especially Tagaytay. The clouds came to greet us in our rooms on the 2nd floor! It was magical. Shivya recently posted..The coolest social media campaign in travel. been to dumaguete and siquijor. dumaguete’s food is amazing! 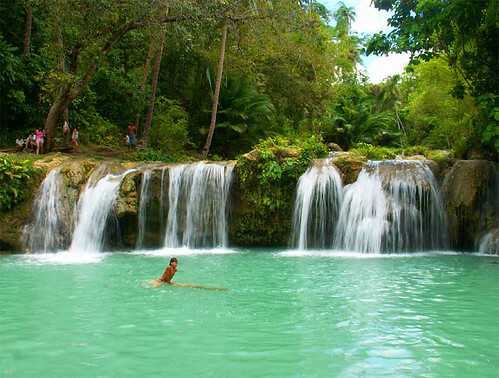 and siquijor is like off-the-beaten-path philippines. and the philippines is already a bit off-the-beaten-path in itself! so yeah, you want convenient yet isolated beaches? then go to siquijor! sheesh. now i wanna go back. haha. Great post! 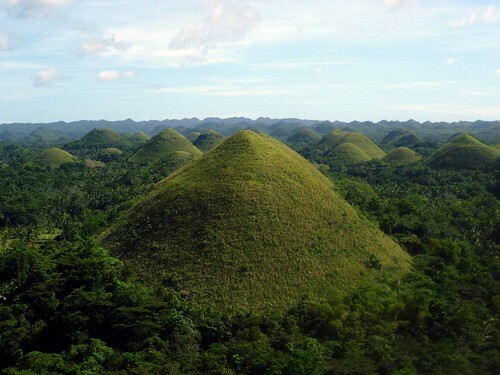 I’m planning to spend a few weeks in the Philippines at the beginning of my SE Asia backpacking trip. I already have Bohol, Palawan, and Manila on my list but now I may have to add Siquijor to.